My first interaction with Jim Henson took me completely by surprise. I was in my twenties, working in Los Angeles at Creative Artists Agency as a story editor. I had met Jim’s daughter, Lisa Henson, and griped to her about my job, explaining that it was far from my true interests which lay in children’s entertainment. A few days later I received a call at Creative Artists. My co-worker who answered the phone said “it sounds like Kermit the Frog is calling you.” My first thought was that this was some kind of prank, but sure enough, it was Jim himself, asking if I would like to have lunch. I would learn later that this was very typical of Jim, reaching out to people simply and directly, bypassing assistants and Hollywood protocol in favor of honest human interaction. We lunched at the Bel Air hotel in Los Angeles. I was incredibly nervous since Jim was a hero of mine. However, from our first greetings, he worked hard to put me at ease. He asked the usual interview type questions but the vibe was not the usual interview vibe. I had the strong feeling that, while he was clearly evaluating me, he was also rooting for me. Our real bonding, however, occurred over a lighter moment. I can’t remember exactly what set us off, it may have been the waiter’s pretentious reading of the “specials,” but something made us start to laugh. It was a moment of silliness that was quintessential Jim. We both had trouble controlling ourselves for a second, before returning to the serious business of the interview. But it was in that fleeting moment, when we were desperately trying to stop giggling, that I think the deal was sealed. I remember leaving the lunch, driving down the 405 freeway, with a very strong feeling that my life was about to completely change. Sure enough, Jim called the next day and offered me the job as his creative assistant. I was to report to his offices in New York City in a week. And so began my amazing years of shadowing Jim Henson. I don’t know how I got so lucky. Lisa – have I thanked you recently? Looking back at this first meeting, I’m struck by Jim’s ridiculous generosity. Here he was a legendary entertainer at the top of his game, and I was an ignorant twenty-something fresh out of college, and yet he immediately put me at ease, leveling the playing field as best he could, in order to have a real conversation. I remember he asked me my opinion about recent movies and seemed truly interested in my response. That was one of his many gifts – the ability to listen to others and make them feel that their creative opinions were worthy. I think this ability came from a natural humility – good ideas didn’t have to come from him, they could come from anyone at anytime – and a real love of the collaborative process. Later I would learn that Jim always enjoyed a big brainstorming meeting (the more the merrier, no matter how logistically difficult), and that he thrived on the creative give and take that took place with his fellow Muppeteers on the set. He knew the best work came from collaboration, but it wasn’t just about collaboration, it was also about community. Jim loved creating community. He was a natural leader, kind but also strong, generous but always focused. If you were lucky enough to land in his community, you laughed every day, you always felt heard, you were inspired to work hard and reach high, and you never wanted to leave. Hear more about Alex’s experiences with Jim Henson and his company at the Henson.com podcast. 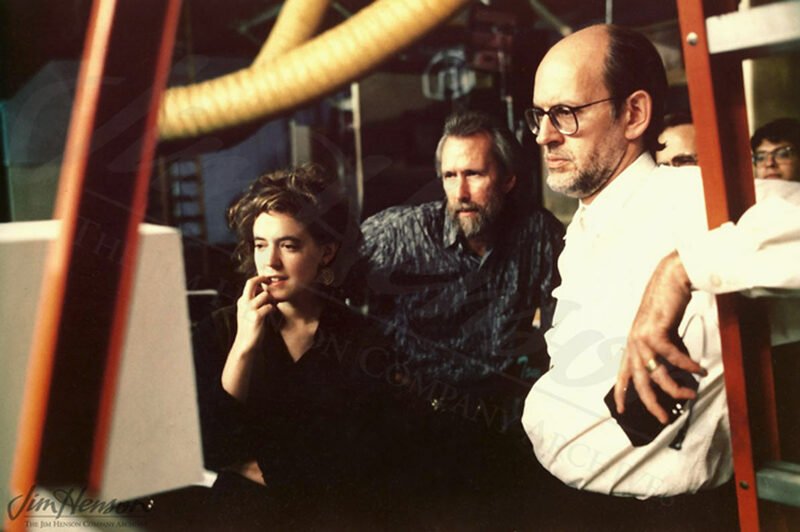 Alex Rockwell with Jim and Frank Oz on the set of Muppet*Vision 3D at Walt Disney World, 1990. This entry was posted in 02-February '88, 1988 and tagged Alex Rockwell, Bel Air. Bookmark the permalink.